A National, Multispecialty, CMS-approved Qualified Clinical Data Registry (QCDR). The Genesis Registry supports all electronic clinical quality measures which are used in MIPS as well as additional custom QCDR measures. It facilitates data connectivity through partnerships with EHR vendors, including Allscripts, Aprima, Greenway, NextGen, Quest Diagnostics/Care360, and STI/Chartmaker, to support ongoing quality improvement through clinical data registries. If you are interested in enrolling and submitting data to ACP's Genesis Registry, please visit www.medconcert.com/genesis and complete the "Contact Us" form at the top of the webpage. Don't see your EHR? 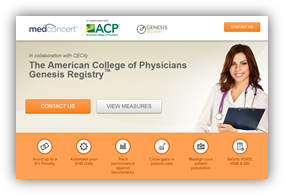 Visit www.medconcert.com/genesis for information about connecting other EHRs to the Genesis Registry. ACP developed the Genesis Registry in partnership with Premier Inc.